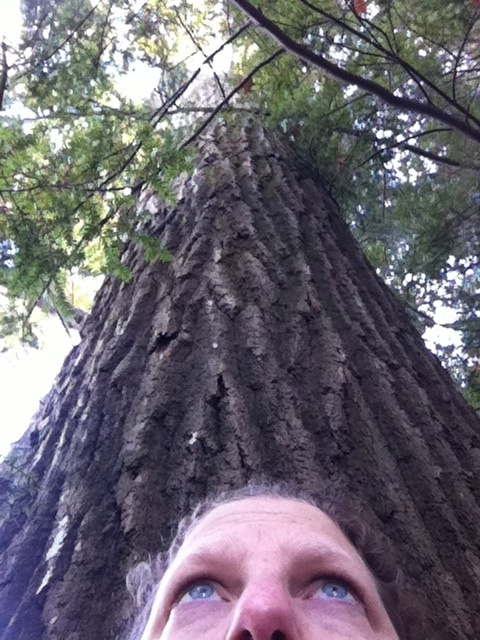 I was fascinated to learn recently that trees, especially big old trees, can communicate with each other and with their entire grove or forest of younger ones. Apparently they do this through a network of fungi that grow in a symbiotic relationship with tree roots. The larger the tree, the bigger the root network, and the more other trees the old one is in contact with. What do they talk about? According to forest ecologist Dr. Suzanne Simard of the University of British Columbia, trees share nutrients and chemical signals through the network. A big old tree can help the younger ones who may be less able to withstand drought, for example, or an insect onslaught. 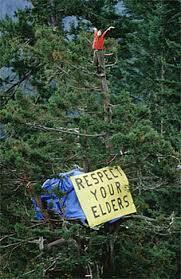 That’s what we know for sure now, but who knows what other wisdom the trees may be sharing? I was reminded of this forest phenomenon this week as two things happened simultaneously: the news broke that folk music giant Pete Seeger had died, and I started discussing with students in my Women Write the World class the first book of the semester, The Legacy of Luna by Julia Butterfly Hill. Luna, you may recall, is a 200-foot-high California redwood that Julia Hill single-handedly saved from the chainsaw by obstinately camping out on a platform high in the tree, for more than two years. 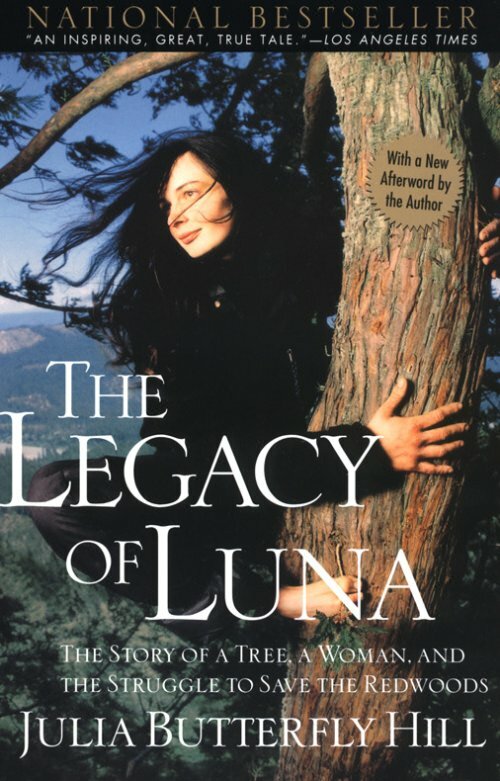 In the book she wrote later, Julia describes how she came to regard Luna as a living consciousness, a kindred spirit with whom she could connect. I thought the students in my class would pooh-pooh that idea, but many of them were willing to entertain the notion that there might have been some actual cross-species communication going on between the massive old tree and the young woman perched in its branches. What is certain is that living in Luna taught young Julia Butterfly Hill many lessons that she never could have learned elsewhere. If Luna had been cut down, as so many of the great old trees have been in forests around the world, all her accumulated wisdom would have been lost too, an incalculable loss to the younger trees around her. We are fortunate that Pete Seeger and other great old ones like him—Nelson Mandela springs to mind, and Wangari Maathai and Rachel Carson, both of whom died of cancer far too young—have been able to leave a written and recorded legacy to us younger ones coming along in their wake. We will be listening to Pete sing, watching Mandela give speeches, and reading the books of Maathai and Carson for years to come. But when we cut down a wise old tree, we silence its network entirely. Forests can regenerate—if they are not sprayed with herbicides, if their topsoil doesn’t wash away and if they’re not turned into artificial factory-style plantations. In many tropical countries the natural forest is destroyed and replanted like this. But even in the best of circumstances, the younger trees will be more vulnerable and less resilient without the oldest trees to shelter and guide them. During the European colonial period, it was an accepted strategy for would-be conquerors to kill or enslave the tribal leaders first, under the theory that their followers would be less able to resist. The Americans took a page out of the same playbook in their treatment of Native Americans, trying to demoralize the tribes by killing, imprisoning and humiliating their leaders. It has been no different with logging. The big old trees are the most highly prized, and are chopped down first, with longstanding and poorly understood consequences. Dr. Simard is arguing for a different kind of forest management plan, one that is respectful of what she calls “the mother trees”—those old survivors who can help the regenerate the forest after the loggers have moved on. 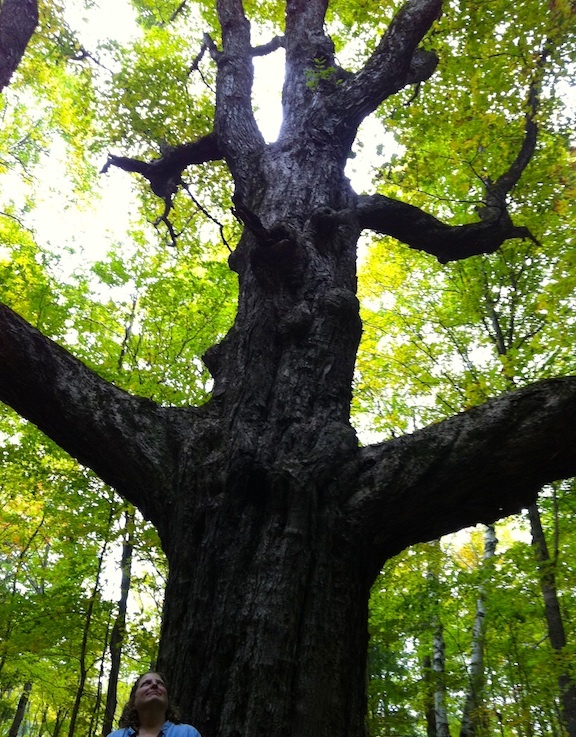 Just as we honor outstanding human elders like Seeger and Mandela, we should be honoring the most ancient living things among us, the old trees. It makes scientific sense (older, larger trees trap more carbon and hence help reduce global warming) and it also makes moral sense. I am reading The Sacred Language of Trees by A. T. Mann. It was given to me by someone who had read my book and thought I would like it.I think you would like it too. Also the Golden Spruce by John Vaillant, which talks about the ravaging of the rain forest in the Pacific Northwest. Trees are such a vital part of our natural ecosystem and for many of us, a vital part of our enjoyment of nature. Thanks for writing about them! I will check out The Sacred Language of Trees, Jan, thanks for the reference! Way cool. You have hit on some very fine points here, and expressed some lovely wisdom, elegant in its simplicity. Here’s a thought. Plants are our elders and teachers. They are far far older than we are, we vertebrates, we mammals. Their wisdom goes almost to the beginning of life on the planet. I agree too. We have much to learn from plants. Once the hierarchy of creation became an accepted idea, humanity lost its connection with an enormous source of wisdom. Putting ourselves conceptually at “the top” of the hierarchy has had some disastrous results. Yes, I totally agree. They are also much better than we are at making the most efficient possible use of the sun and the nutrients on the planet. I am also curious about the wisdom in fungi. As you may remember, I’ve been reading Terrence McKenna lately and finding his ideas about mushrooms as some kind of intergalactic intelligence provocative, though I know my friend Mato thinks I’m silly to entertain such notions. At least they distract me from all the doom-and-gloom of the here-and-now!